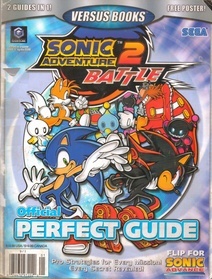 Sonic Advance & Sonic Adventure 2: Battle Official Perfect Guide is a strategy guide for Sonic Advance for Game Boy Advance and Sonic Adventure 2: Battle for GameCube, published by Versus Books in North America. The front cover references Sonic Adventure 2: Battle while the back references Sonic Advance. This page was last edited on 27 September 2018, at 08:15.